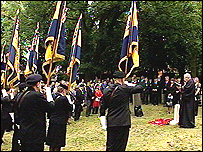 The grave of a soldier who won the Victoria Cross for his bravery in the Crimean War has been dedicated in a ceremony in Nottingham. Campaigners have worked for two years to raise £1,200 to get a headstone for Pte Robert Humpston. He was buried in a pauper's grave in Nottingham in 1884. 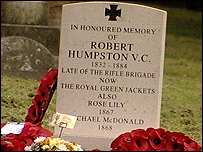 Derby-born Pte Humpston was 23 years old when he won the Victoria Cross in 1855 for capturing a Russian rifle pit near Sebastopol. About 100 people gathered at the community grave at Nottingham Cemetery where he is buried for the dedication. "He attacked and cleared the gun pits held by the Russians - allowing the English army to progress and saving a lot of English lives," project co-ordinator Tony Higton said. His great-great-great-granddaughter Kathryn Humpston said: "It feels very special that after 124 years Robert Humpston is going to be recognised for what he has done. "I feel quite proud and honoured to be part of the day." Pte Humpston also served in India at the time of the Indian Mutiny. He returned to England where he worked on the railway as a labourer. He was married and had one son. His grandson Arthur died in 1917 at the Battle of Passchendaele.